Nationality: American. Born: Angela Maxine O'Brien in San Diego, California, 15 January 1937. Education: Attended University High School, Los Angeles. Family: Married 1) Harold R. Allen Jr., 1959 (divorced 1968); 2) Roy T. Thorsen, 1974, daughter: Mary. Career: Child model at age three; 1941—film debut at age four in Babes on Broadway ; made some films after 1951, but has worked since mainly on stage and television, including the mini-series Testimony of Two Men , 1977; 1979—civilian aide to Secretary of the Army Clifford Alexander. Awards: Special Academy Award, as "outstanding child actress of 1944," 1944; Women's International Center Living Legacy Award, 1996. Address: 1250 La Preresa Drive, Thousand Oaks, CA 91362, U.S.A.
"The Journeys of Margaret," interview with Eve Golden, in Classic Images (Muscatine), August 1993. Ciné Revue (Paris), 21 August 1980. Baker, B., "Margaret O'Brien," in Film Dope (London), July 1992. Ellenberger, Allan R., "Journey for Margaret's Oscar," in Classic Images ( Chicago), March 1995.
musical talent. Beginning with her first hit, and only her second film, Journey for Margaret , which was made at her home studio, MGM, O'Brien relied on scowls and cynicism as much as her dimples. She invariably wore a pointed cap and usually was deadly serious as she seemed to carry the weight of the world on her little shoulders. Her two best films, both made in 1944, were The Canterville Ghost and Meet Me in St. Louis . In the former, O'Brien captured the audience, playing the pivotal role of a young duchess whose courage inspires both a 400-years-dead ghost played by Charles Laughton and a brash American G.I. played by Robert Young. 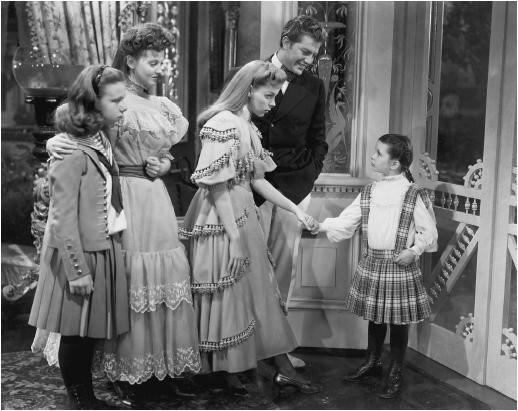 In Meet Me in St. Louis O'Brien had a relatively minor role in comparison with star Judy Garland and many well-known members of the MGM stock company, but her big scene in which she hysterically destroys the snowmen on the front lawn on Christmas Eve has become famous, and led to her Oscar. O'Brien appeared in a number of productions after the war, including Little Women , but her career declined dramatically, like so many other child stars, as she reached puberty. While she was in her prime, O'Brien was considered one of the best child actors on the screen, although in retrospect most of her films show her in a whiny, unattractive light. She has continued to act sporadically over the years, but has never risen above minor featured parts. Her most widely seen role as a adult was that of an overweight housewife in Robert Young's television series, Marcus Welby , M.D.